Often times, I crave for the most unexpected things. Take today for instant, I woke up craving for pork machang, which is a triangular-shaped dimsum that is made of brown glutinous rice mixed with pork, chicken and shiitake mushroom. I can't stop thinking about this on my way to work even imagining adding tomato ketchup on top of my machang. The craving stayed on all day that the moment I got to the car, I asked my mom if we can drop by the Little Store for some machang on our way home. A couple of weeks ago, I found myself craving for Mexican food. This brought about three consecutive visits to a mexican restaurant in my neighborhood and a quick fix at Taco Bell. Surveying their menu board, I noticed that they have a new addition to their already mouthwatering line-up. It's called the Cheesy Gordita Crunch (Php. 99) which looks like a taco but is wrapped in white tortilla bread. It got me wondering what it tastes like that I got that together with my favorite Nachos Supreme (Php. 69) and some Churros (Php. 49) for dessert. As soon as my Gordita Crunch arrived at the table, I unwrapped it and took a small bite. 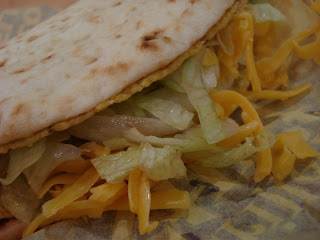 I love the mix of the hard, crunchy taco shell and the soft, chewy tortilla bread. They also didn't scrimp on the filling as my Gordita Crunch was literally bursting with ground beef, veggies and lots of cheese! There's one thing missing though, I wish they have added some sour cream to give it a complete Mexican feel. I love Taco Bell's Nacho Supreme. First of all, the chips has just the right crisp and saltiness which perfectly blended well with the sour cream, cheese, tomatoes and beef. This is my favorite comfort mexican food. It was actually my first time to try Taco Bell's Churros and I'm glad I did. I shared this with my friends K and M who both enjoyed our simple Mexican fiesta that afternoon. Too bad the serving was pretty small but since we ate so much, it turned out just right for the three of us. 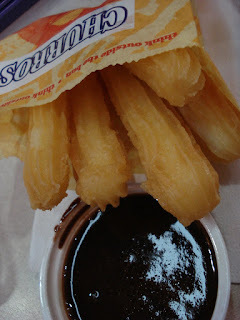 One order of Churros will give you 5 bite-size pieces and a small container filled with rich, dark chocolate sauce. Eat the Churros while it's hot to enjoy the crunchy, a bit oily goodness of this dessert. How I wish Taco Bell would have more branches around the Metro. Luckily, Gateway Mall is not so far from my place but it would still be nice to have one that's just a stone-throw away. 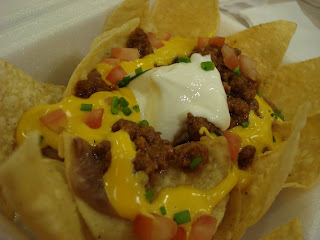 Taco Bell has two branches at the Gateway Mall (Ground Floor and Food Express) as well as in TriNoMa. I always get my Mexican food fix in Mexicali.. =) yummy enchiladas. Taco Bell Churros! That's what I've been accustomed to snack on before every movie at Gateway Mall. That was when I was still working during the day. So there's a Taco Bell in Gateway! Never been to Gateway and to any Taco Bell branch for that matter! Oh my I'm getting hungry at 5:00AM!